Hannah had always been a bright, very bubbly and an active young woman. She excelled at school and was chair of the school council and head girl. She played many sports including swimming, netball and when she was 19 was running 8 miles twice a week. Hannah enjoyed mathematics and did well in her A levels and gained a place at University in October 2012 to study Maths. She was having a wonderful time experiencing the benefits of student life and enjoying studying when one morning during March 2014, her life changed abruptly. She woke up with a severe pain in her chest eventually ending up in the hospital A&E department. They found no cause for her symptoms and after a few hours she was discharged. One clinician who examined her right sided weakness referred her to a neurologist. With a small family history of MS this was mentioned as a possibility - a devastating prospect for a 19 year old. An urgent MRI scan was undertaken. Seeing the neurologist the next day privately and anxiously awaiting the outcome is one of the worst experiences of our lives. To our great relief, she did not have any 'brain lesions' and with greater understanding we now believe that she narrowly escaped being labelled into Multiple Sclerosis. During this period, fretfully searching for an answer, Hannah continued to deteriorate and became virtually housebound. She struggled to walk up the stairs. She was very distraught at what was happening to her. 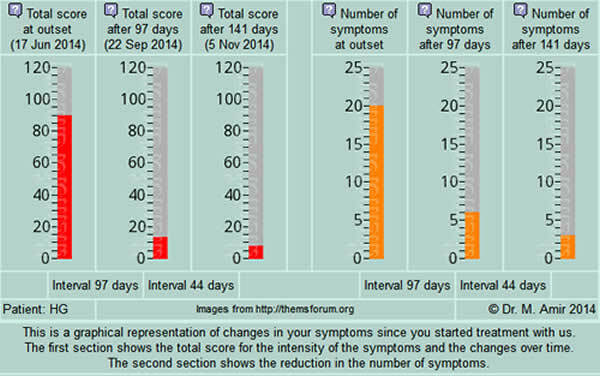 Ultimately at the end of the three months when the myriad of tests were all negative Hannah was finally given a diagnosis of ME / CFS or Fibromyalgia. Hannah was further alarmed at the stories she read on the internet about people having these illnesses and how badly it impacted their lives. 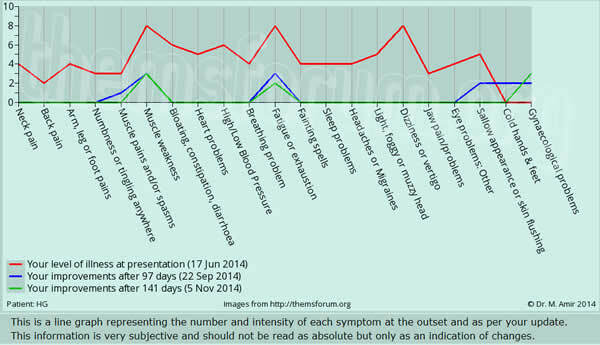 Every website said “The exact cause of ME / CFS / FM / MS is unknown and that there is no cure for any of these illnesses but there were lots of drugs to control the symptoms”. On reflection, we now realize that her facial changes were a key observation and this was always on our minds. Dr Amir was able to show us how all the symptoms were related to the asymmetry of her jaw. He showed us Hannah’s very misaligned jaw which was affecting the vertebrae in her neck, lower back and the hip bones. He showed us how the jaw was affecting the ear organ causing the dizziness. How the shallow breathing was affecting her energy system and causing her belching. He also reassured us that Hannah did not have any disease process going on and the entire illness emanated from the asymmetry of her jaws and teeth. He had seen this many times before. Tendency to feel faint, syncope and dry eyes. The fatigue has virtually disappeared and the weakness in her arms and legs has much improved. Interestingly Hannah's ribs no longer protrude and her hips are visibly completely aligned. She has a few problems sometimes but these are almost immediately resolved by Dr Amir changing the appliances or his strategy. At just over three months into the treatment Hannah has recovered a lot and has been able to return to university and is getting stronger with each passing day. She is also back to her noisy, bubbly self! The family is so relieved. Hannah and her family are eternally grateful to have found Dr Amir so early in her illness as she was physically deteriorating so rapidly that walking was becoming a significant concern and disability a real possibility. We would encourage anyone with these symptoms or with such a diagnosis to see Dr Amir to determine if the cause is the same as Hannah’s so he can work his magic on them. We believe that Hannah has been saved from being drawn into a ‘chronic incurable illness’ like CFS / ME / MS or Fibromyalgia. Our advice to everyone with these or in fact many chronic disease labels is to have their jaws checked. You may have a chance to recover fully. Mari Gay - 31st Oct 2014. If any family or individual wants to discuss this with Hannah's mother Mari she is more than happy to help. You can phone her on Tel: 07436037332. This information, below, is slowly seeping into the consciousness of those who use social media to express dissident views. It became a reality for me during the campaign in support of Dr Andrew Wakefield and attempts to write the truth about those parents whose children were damaged by the MMR vaccine. The pharmaceutical corporations used hundreds if not thousands of individuals worldwide to counter the honest narrative of these parents. Unfortunately, in my opinion, it is much harder to resist this propaganda in the field of vaccines and health for instance, than it is with respect to the police or even government policy on global warming. The great majority of those engaged in battles with the drug companies over vaccines really do believe that in 'democracies' different rational views, especially those backed by research and references, have equal weight. In fact nothing could be further from the truth. 'A 21st century democracy is an' oxymoron, a contradiction. As a number of people have been predicting since the beginning of the post-industrial period, the corporations have destroyed any chance of democracy and we are all being dragged inch by inch into an Orwellian world where the totalitarian perception of reality is enforced every day by ghost like voices repeating the official reality of life, economics and government. I personally can't see clearly the answer to this ongoing bending of reality on social media and in all media. All our understanding of the political process, of adverse activism and revolutionary endeavour, has taught us that positions have to be fought and defended and that all mistruths of the opposition have to be pulled apart analyzed, rebutted and refuted. This political strategy is, however, hardly tenable anymore, because we find ourselves arguing with ghosts, in disputes with unaccountable and dishonest voices. While fifty years ago, it was possible to have a strategic argument about - let’s say - the police, using public outlets, the radio, newspapers and even ones 'own' parliamentary representative, today everyone with any position in the information chain is 'on the other side' if your view is radically opposed to corporatism, no one will speak to you or with you except a handful of perceptive and like-minded people. In my experience nowhere is this battle of misinformation more evident, this conspiracy of lies more determined, this hollow democracy more demonstrable than in the war waged by the drug cartels and professional medicine against homeopathy. For reasons too deep and difficult to discuss here, the gladiatorial combat between professional orthodox medicine and homeopathy has been impossibly biased against the scientific method, scientific reasoning and the ad hoc profit orientated and often deadly arguments in favour of 'evidence based medicine' - however many people pharmaceuticals kill, and this figure is now in the hundreds and hundreds of thousands, the arguments in favour of homeopathy which has never killed anyone but saved thousands of lives, are supposed to be cranky, irrational, unscientific and unproven. I have no clear answers to this darkness that has enveloped the exchange of views in modern corporate society. Although it is evident, that social salvation exists in close relations within communities and the absolute rejection of corporate totalitarianism on every level. We must fight first for our own independence of mind and then for the independence of our closest relationships and finally for our communities. While at one point in its development the State might well have been benign, today its influence, its strategy and its structure have been overtaken by the power of the unaccountable corporation. Those who now have power over us are solely concerned with robotic action, money, and the protection of their own security and perpetuation, they have no culture, no sense of human dignity, little intelligence and absolutely no wisdom. Yes, continue to challenge the views of shills on social media but far more profoundly, reject the advances of corporatism begin to live your own life and help others live theirs. Don't be seduced by temporary material gains, which together with a developing military strategy are herding civilization closer to the cliff of self-destruction. According to the government’s own statistics, the flu vaccine is causing about 269 people per year to become injured (including some deaths) with Guillain-Barré syndrome (GBS). People die from the flu, usually because of secondary complications, such as pneumonia or complications of chronic medical problems. However sometimes people die from the vaccine itself and for that reason, I never recommend people take a flu shot. The latest bad news comes from Italy, which has suspended a flu vaccine produced by the Swiss company Novartis after 12 people died after receiving the vaccine. Italy’s pharmaceutical watchdog first identified two batches of the vaccine after three people died within 48 hours of receiving the shot, but are now investigating six batches. In the United States, the US Centers for Disease Control and Prevention is saying that the current flu vaccine is not a good match for the most common seasonal flu strain currently circulating in the United States. Much of the influenza virus circulating in the United States has mutated and this year’s vaccine does not provide good protection against it, federal health officials are warning. Flu season’s barely starting, but most cases are being caused by a strain called H3N2 this year, the Centers for Disease Control and Prevention said in a health warning issued to doctors in November. An analysis by the CDC of the 2012-13 flu season found that the vaccines’ effectiveness for all ages against influenza A subtype H3N2, the most common strain during that season, was 44%, compared with only 19% for people older than 64. The US health agency issued an advisory to doctors noting that flu virus samples the agency took from Oct. 1 through Nov. 22, showed that under half were not a good match for the current influenza A (H3N2) vaccine component contained in flu shots for the 2014-2015 season. According to the CDC, flu activity has been low but is increasing and influenza A (H3N2) viruses appear to be the predominant strain, with cases having been detected in almost all US states. In past seasons when the influenza A (H3N2) strain had mutated from the vaccine strain, flu shots were less effective, the CDC said in the advisory. The current seasonal flu shots will still protect against flu strains that have not mutated, such as the influenza A (H1N1) virus and the B viruses contained in the vaccine. The CDC is stressing that doctors should be prepared to use antiviral medications when needed. These include Roche’s Tamiflu and GlaxoSmithKline’s Relenza even though a recent study from the Cochrane Review, a respected research network, suggests that while these medicines can shorten flu symptoms by around half a day, there is no good evidence behind claims they cut hospital admissions or lessen complications of the disease. In the past year, there have been 9,632 hospitalizations related to influenza, according to the CDC. That is about 36 hospitalizations per 100,000 people in the US. Sixty percent of those cases were in people between the ages of 18 and 64. The proportion of flu-related deaths during the 2013-2014 flu season hovered around 6% and remains below the epidemic threshold of 6.8% death rate. As of Aug. 16, 2014, there were more than 105 flu-related deaths in children over the past season. Previous seasons saw paediatric deaths range from 35 to over 170. A 2014 report by the Department of Homeland Security with the ominous title DHS Has Not Effectively Managed Pandemic Personal Protective Equipment and Antiviral Medical Countermeasure” found that 84% of the department’s store of hand sanitizer was expired - some as much as four years out of date - and that 81% of the department’s antiviral medication would expire by the end of 2015. To solve this problem, the department is “applying for a shelf-life extension with the Food and Drug Administration” for the influenza drug Tamiflu even though the drug is dangerous and ineffective. The June 2014 report from the Department of Justice on damages paid by the US Government to vaccine victims was recently published on the US Department of Health and Human Resources website. There were 120 cases of vaccine injuries decided. 78 cases received compensation, while 42 cases were denied. The June 15, 2014, report covering a 3-month period shows that the flu vaccine is the most dangerous vaccine in America. 78 cases were awarded settlements for vaccine injuries, with 55 of the settlements being for the flu shot, including one death. Most of the settlements for injuries due to the flu shot were for Guillain-Barré Syndrome. Other flu vaccine injuries included: Chronic Inflammatory Demyelinating Polyneuropathy, Rheumatoid arthritis, Shingles, Brachial plexus neuropathy, Bell’s Palsy, Brachial neuritis, Transverse myelitis, Lichenoid drug eruption, and Narcolepsy. Polio is an infectious disease caused by a virus that lives in the throat and intestinal tract. Up to about 72% of susceptible persons infected with polio have no symptoms. However, infected persons without symptoms can still spread the virus and cause others to develop polio. About 24% of infected susceptible persons have minor symptoms such as fever, sore throat, upset stomach, or flu-like symptoms and have no paralysis or other serious symptoms. About 1-5% develop aseptic meningitis with stiffness of the back, back, or legs, and in some persons increased or abnormal sensations a few days after the minor illness resolves. These symptoms typically last from two to ten days, followed by complete recovery. Less than 1% of polio cases result in paralysis of the limbs (usually the legs). Of those cases resulting in paralysis, 5-10% of the patients die when the respiratory muscles are paralyzed. Hundreds of People are afflicted with Guillain-Barre Syndrome every year from the Flu shot. Is it because the CDC allows the neurotoxin thimerosal in the vaccines? The flu vaccine really does not work so why take the risk? There are better ways of avoiding or treating the flu than using dangerous vaccines. The CDC itself admits that the vaccine does not work. Influenza outbreaks on Navy Ships among fully vaccinated sailors is common. Do not let your paediatrician scare you with erroneous influenza death statistics. If your paediatrician or doctor refuses to provide medical care to you or your child unless you agree to get vaccines, find another doctor. Harassment, intimidation, and refusal of medical care is becoming the modus operandi of the medical establishment in an effort to stop the change in attitude of many parents about vaccinations after they become truly educated about health and vaccination. These doctors may be viewed as medical terrorists so beware and take care.